Across Europe, 99% of businesses are SMEs, meaning that they have fewer than 250 employees. Whilst individual deals might be lower in value than enterprise deals, the sheer size of this market makes it extremely valuable, yet it is underserved by telecoms service providers. Traditionally, B2B service providers have used resellers as an efficient way of engaging this market. 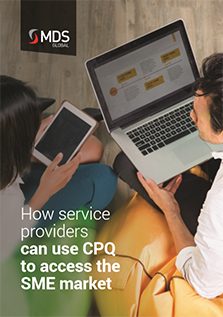 However, with SME sales becoming increasingly complex, service providers have a new opportunity to sell directly to these customers with the help of a CPQ (configure, price and quote) system. Read the whitepaper to learn more.